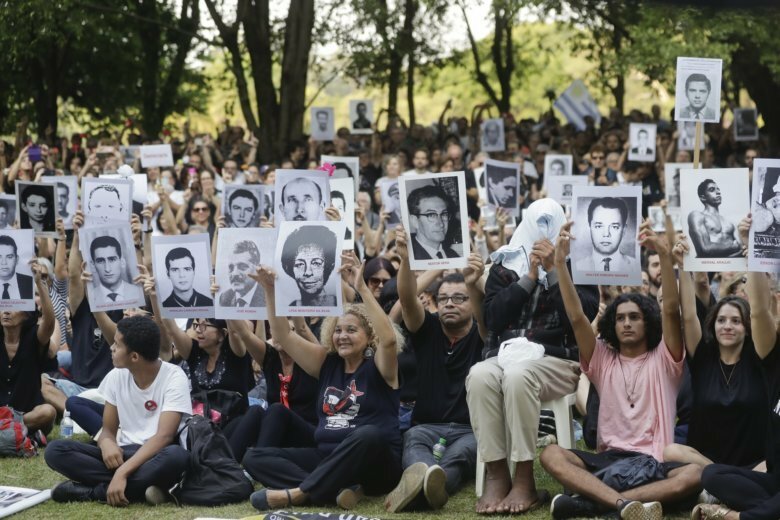 SAO PAULO (AP) — Thousands of demonstrators took to the streets in several major Brazilian cities Sunday to protest the 55th anniversary of the coup that instituted the country’s 1964-1985 military regime. The demonstrations took place in 10 states, a day after an appeals court judge overturned another judge*s decision barring the commemorations sought by far-right President Jair Bolsonaro, a former army captain who has sparked controversy with comments seen as racist, homophobic and misogynist, and has praised the authoritarian regime. Brazil’s armed forces overthrew President Joao Goulart on March 31, 1964. “Bolsonaro expresses his love for the dictatorship because he thinks that violence will resolve the country’s problems,” said Marcos Souza, a 37-year-old bank worker in a Rio protest. The celebrations called for by Bolsonaro were roundly condemned by human rights activists and social groups that quickly organized Sunday’s protests. A 2014 report by the country’s truth commission concluded that at least 434 people were killed or disappeared during the military regime Bolsonaro repeatedly praises. During Bolsonaro’s 28 years in Congress, he repeatedly expressed support and admiration for the military regime. During last year’s election, that position angered and shocked many Brazilians while seducing others who think of the dictatorship as a time of low crime and general order. Bolsonaro has said the dictatorship should have gone farther in killing communists who threatened Brazil. A video sent by Brazil’s Presidency to journalists via WhatsApp on Sunday defended events on March 31, 1964. “The army saved us; there is no way to deny this and history can’t be changed,” the man said. Asked by The Associated Press, the Presidency’s press office declined to say who had produced the video.